Shaaark! Video Slot Guide & Review - Casino Answers! Shaaark! is a 5-reel, 25-line video slot found at Vegas Technology online casinos, featuring wild symbols, scatter wins and a free spins feature. 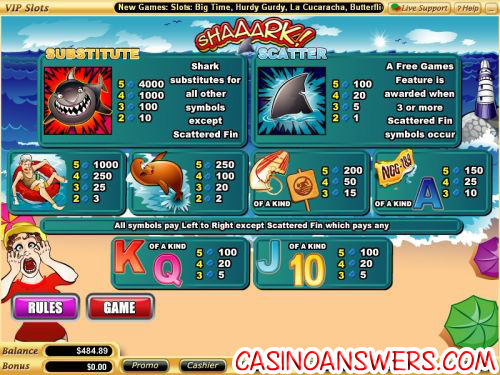 You can play the Shaaark video slot game at USA-friendly casinos English Harbour Casino and Caribbean Gold Casino. Bets on Shaaark are $0.01, $0.05, $0.25, $0.50, $1, $5 and $10 per line. You can play up to 25 paylines. The largest total bet you can make on the Shaaark video slot is $250 per spin with the lowest total bet being a penny per spin. Play the maximum number of lines by hitting the “Bet Max” button or hit the “Spin” button for other wagers. Start spinning the reels now at English Harbour Casino! The highest paying symbol in the Shaaark slot game is the Shark wild symbol. 5 Shark wild symbols on an active payline will pay the top jackpot of 4000X your bet per line. The Shark symbol will substitute for all symbols with the exception of the Fin scatter symbol. When the Shark symbol is included in a winning combination, your win will be doubled. The Fin symbol is the scatter symbol on the Shaaark slot machine. It will pay out 1X for 2 symbols up to 100X for 5 symbols anywhere on the reels. When 3 or more Scattered Fin symbols appear anywhere on the reels, you will win 10 free spins with a 2X multiplier. All of your winnings will be doubled. The free spins feature can be re-triggered. During free spins, selected symbols turn into the Shark symbol. Free spins are played at the lines and bet of the trigger game. Free spin wins are added to payline and scatter wins. Hit “Autoplay” to access the autoplay mode on Shaaark!. You can select the number of spins (up to 500), number of seconds between spins (from 0.25 to 2), set it to stop once all spins are complete, stop when the jackpot is won, stop if a win exceeds or equals (up to $250), stop on any win and stop if credits increase/decrease by (up to $250). Autoplay can be stopped at any time. Although Shaaark does have a free spins feature and a wild symbol that can double your winnings, it lacks a bonus game that really could have been fun with the shark theme. Fans of the movie Jaws will especially enjoy playing the Shaaark video slot at English Harbour Casino! Are players based in the USA able to play Shaaark for real money? Yes, players located in the United States of America are welcome to play Shaaark! at their choice of any Vegas Tech online casino, including two of our favourites, English Harbour Casino and Caribbean Gold Casino. Is there a free Flash game of Shaaark! available? 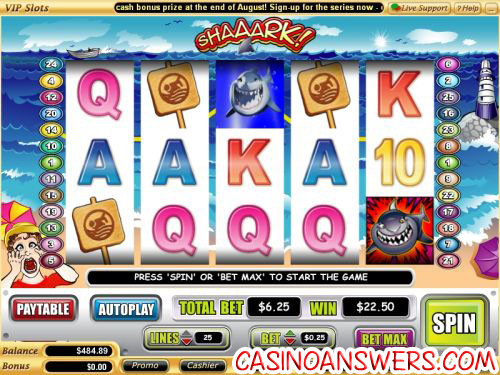 You can play a no download Flash version of the Shaaark slot game at English Harbour Flash Casino and Caribbean Gold Flash Casino. You can play it for practice in free mode or for real money. If you can’t get Flash to work on your computer, make sure you have the latest version of Adobe Flash Player installed. Are there any shark casino games?